It’s still winter outside, but spring is showing signs of returning – at least in my mailbox. 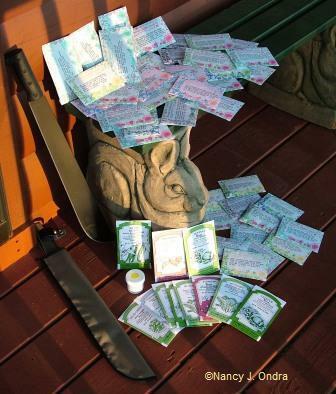 The last two days have brought a bounty of seed orders: Pinetree Garden Seeds (42 packets) and Territorial Seed Company (11 packets) on Tuesday and Thompson & Morgan (13 packets) yesterday. So, 66 so far, and many more on the way! What was I thinking? I should have been thinking of how I’m going to manage all of this with four plant lights and one cold frame. Oh well, it’s worked out every other year, so I’m sure I’ll manage somehow. (As a side note, the rather ominous-looking bladed instrument in the photo is a machete from Pinetree. I’ve always wanted one, and I couldn’t resist it at $9.98. Many of the seeds are repeats of last year’s favorite veggies and flowers, but I do have a few new things to try. One of the most intriguing so far is potato seeds – not seed potatoes, but actual potato seeds. They arrived from Territorial in this curious little container protected with a large tuft of cotton. Never having seen actual potato seeds, I didn’t know what to expect. 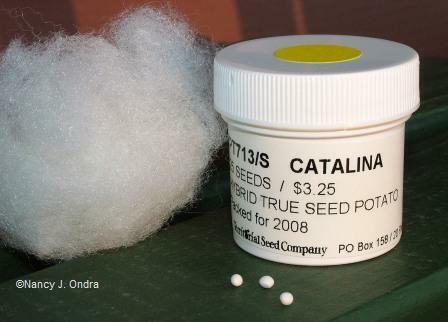 I wish I’d been more careful when I pulled out the cotton, because I managed to lose a few of the seeds in the process. As you can see (those three white dots in front of the container), they’re pretty small! 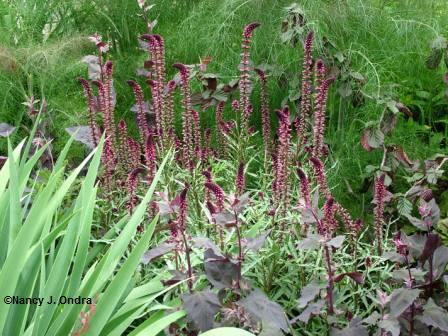 One favorite that I haven’t had for a few years is Lysimachia atropurpurea. Not to be confused with the aggressive purple-leaved loosestrife (Lysimachia ciliata ‘Purpurea’) or the invasive purple loosestrife (Lythrum salicaria), this delicate beauty usually acts like a biennial here. The first year, its clumps of grayish green leaves are interesting but not especially showy. If they make it through the winter, though, the second-year show is fantastic, with spikes of blackberry-scented, violet-colored flowers in early summer. I’ve let them go to seed in past years but they’ve never self-sowed, so I’m thrilled to have a new batch of seed to try again. If I remember correctly, that Lysimachia atropurpurea is one of Elisabeth Sheldon’s favorites, too. Have you read any of her books? Hi Kathy! I don’t have any of her books, but I’ve read some of her writing in Fine Gardening. Nan: I didn’t know you had your own site! I read Kathy’s interview and saw the link! Great! I can’t wait to catch up on your garden! I did grow this Lysimachia and it is quite interesting. Great color and rather unusual looking. It did get quite a few comments in the garden. I’m glad you found your way here, Layanee! If you stop back and see this, would you let me know if the lysimachia was biennial for you too, or it it hung on for a while? You’d better hurry, Barbara: I’m ordering more right now! I promise to leave some for the rest of you, though. Nan: It was a biennial here. Worth planting again though. Thanks for the info, Layanee. I guess I’ll be waiting until next year for flowers, unless I can scare up some already-started plants this spring. I have the L. ciliata, it is very aggressive. I have underlined your pick several times, unsure about another invasive lys. Now it can be tried since you gave it your blessing. Thanks. Dare I say that I *wish* this one were more aggressive? I would have been happy with just one self-sown seedling! I’d never seen potato seeds either but now I have on your blog. How long will it be before they are turned into potatoes? I have no idea how long it will take to actually get potatoes, but believe me, I’ll be posting about my results! And well, yes; I’m afraid my garden does get rather jungle-like by the end of the growing season. I think I will let my visitors use the machete to hack their way through the lesser-used paths.